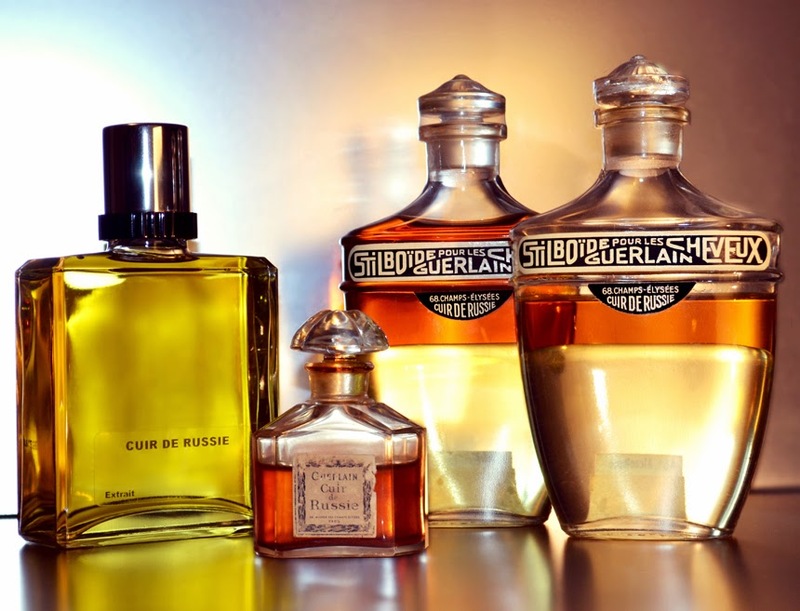 A Gift from Guerlain: CUIR DE RUSSIE, revisited. Loyal Sorcery of Scent readers may well remember my '5 Guerlains in 5 days' series from a few years ago... a collection of ten articles focusing on rare, limited edition or practically-unheard of Guerlain perfumes that have passed across my desk and under my nose. This series featured a handful of perfumes from history, created before olfactory pyramids and widely-disclosed formulas were the norm. This being said, with a number of them I was flying blind... attempting to pick out individual accords through my modest sense of smell, and intuition alone. 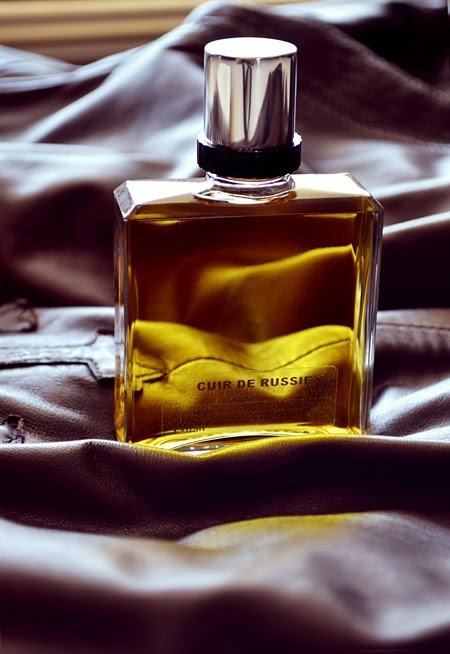 One scent that moved me monumentally, and continues to do so to this day, is the elusive Cuir de Russie... a post-Industrial Revolution creation authored by Aimé Guerlain in 1872. I was blessed to stumble upon a small quadrilobe of the parfum, and a pair of stilboide flacons... each of which showed a distinct separation of the parfum from the carrier oil, which made it simple to remove the parfum component with a pipette. Long have I relished the perfume, and have used it as a signature scent on special occasions. But I've also lamented the thought that one day my reserves will dry, and there could be no hope ever of seeing it replenished. Through a strange twist of fate, however, all of that changed earlier this week when I took receipt of a mystery package from Guerlain in Paris. In-house perfumer Thierry Wasser and his right-hand Frederic Sacone have spent the last months leafing through the Guerlain archives... studying the brittle, foxed pages of hand-written manuals rich with perfume formulae. In doing so, they have been peering back across the ages, deep into the vast history of the world's most revered perfume house. Their intention - to populate the new "Hall of Mirrors" museum installation at 68 Champs Elysées with scents from ages past... a gallery of odeurs, that until now, have been largely lost to the halls of time. Visitors to the newly-renovated flagship store can freely sniff these resurrected perfume ghosts from scented mouillettes. Not only have Wasser and Sacone recreated the original formulas of parfums largely unknown, but they have also reconstructed known scents from the current Guerlain stable as closely as possible to how they would have originally smelled over a century ago. These perfumes are not for sale, unfortunately, but offer Guerlainophiles a unique opportunity to appreciate Guerlain's antique artistry. What it also suggests, is that Guerlain are being up front and transparent about the evolution of their known classics whose formulas must shift with time, trend and, more recently, regulations. I applaud this transparency... where most establish brands vehemently deny that reformulations exist, Guerlain have made it a point to illustrate how. I believe my indulgent gift was sent to me because of my known love of Aimé Guerlain's unique take on Russian Leather. And in the Cuir de Russie spectrum, this one knocks all others that share the same name flat on their backs! There are none of Gabrielle Chanel's aldehyde-rich semi-transparent shenanigans... the Guerlain interpretation - I still maintain - is possibly the thickest, smokiest iteration ever made. The 'modern' extrait from my gifted bottle is the identical twin to my vintage... with perhaps only the citrus flight being more pronounced and intact, as compared to my oxidised, over-macerated antiques. Wasser and Sacone have been true to their word when they say their formulas are original... Cuir de Russie 2014 is every bit as unapologetic and robust as my bottles are from the 30s to the 50s. Key notes present in this perfume are citrus, birch, styrax, and a floral nucleus including iris and gardenia. These florals are so seamlessly worked in to the composition that they only peer through the plumes of coal-grey bitter smoke from time to time. The trail is resolutely chypre in style with abundant musks and oakmoss. Cuir de Russie is dry, sooty, and still defiantly tippy-toes the line between masculine and feminine. I am not altogether certain if this arresting scent will join the others in the famed Hall of Mirrors at 68 Champs Elysées, but a part of me genuinely hopes it does. It would be an opportunity missed not to share this unique and arresting odeur with the world... if not to memorialise the work of Guerlain's masterful forefathers, then to celebrate Wasser's efforts in remaining true to Guerlain's vast and hallowed history.